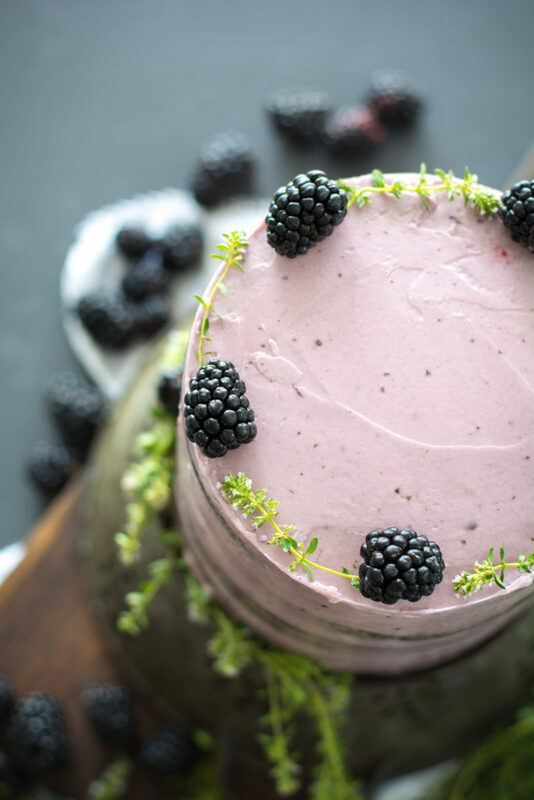 Chocolate Zucchini Cake with Blackberry Buttercream is the result of an overabundance of zucchini in my garden and lovely blackberries from my farmers market. Zucchini Chocolate Cake is the greatest garden perk. 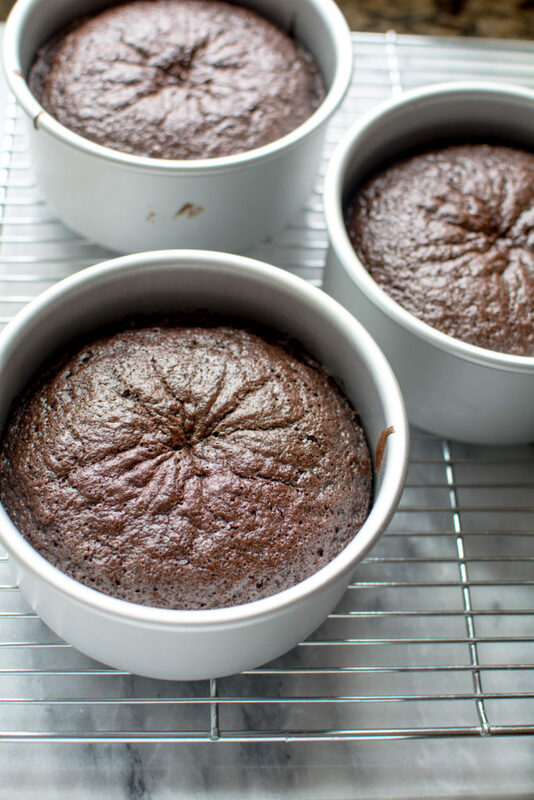 This recipe for Zucchini Chocolate cake is extremely moist and tender. 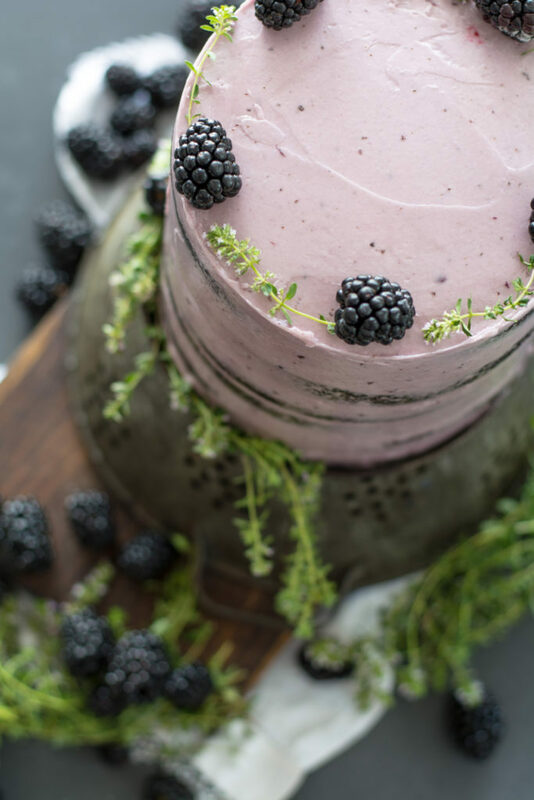 I wanted to create an earthly, botanical zucchini cake so it only made sense to ice it with a Blackberry Swiss Buttercream made with local sweet blackberries. 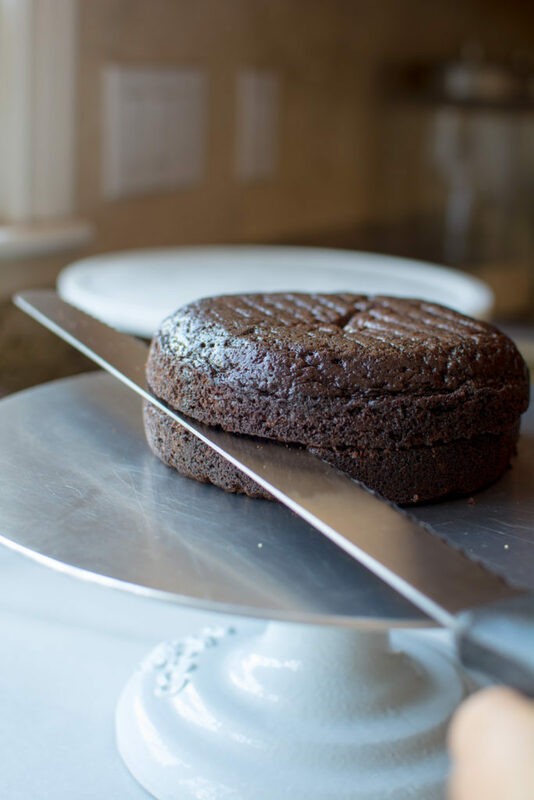 Step-by-step photos and instructions will make this cake a breeze to make along with a fabulous tip for making all of your cakes extremely moist and delicious. You will need to click on the following links for the recipes. You will find the step-by-step photos and instructions to make both of the recipes. I have made just a few changes that I will walk you through along with printable recipes and the end of the post. Instead of using a baking sheet, I am using three 6-inch round cake pans. You may use two 9-inch if you don’t have 6-inch pans. 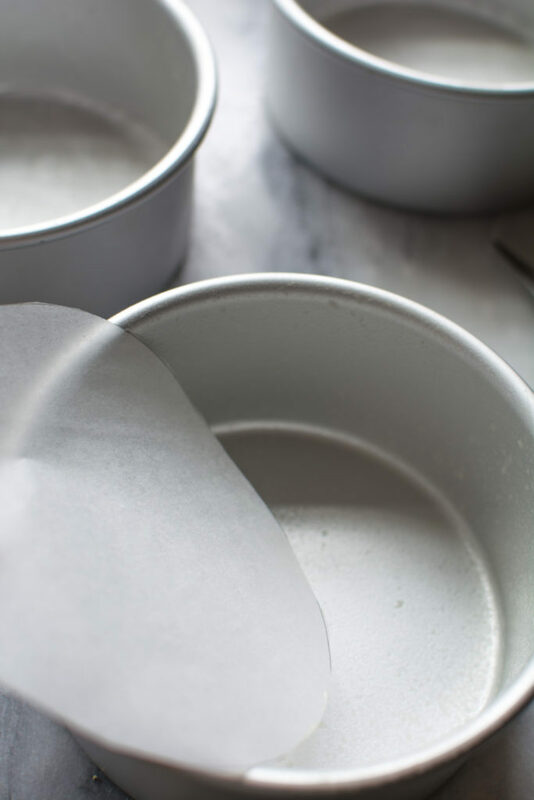 Begin by greasing and flouring each cake pan. Line the bottom of the pan with a round of parchment paper. Set aside. Divide batter equally between the three pans. 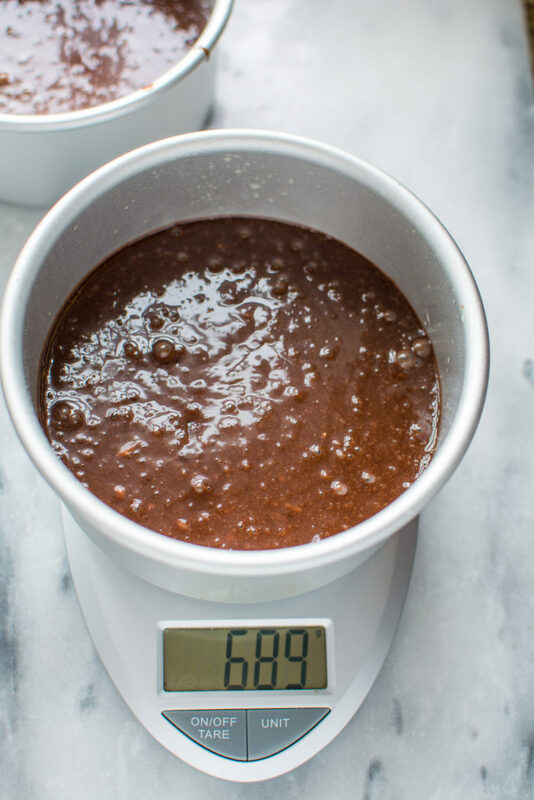 I use a scale and measure in grams to evenly divide the batter. This was my layers are equal is size. Bake the cakes in a 350 F degree oven for 30 minutes or until cake springs back with lightly touched. Remove from pans and allow to cool for 5 minutes. Carefully remove the parchment paper. 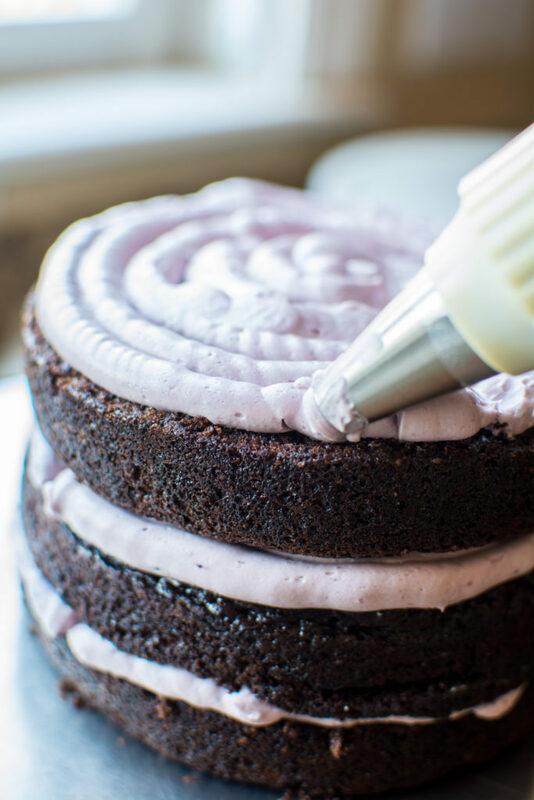 TIP: This little step will help you create extremely moist cakes every time. While the cakes are still hot (YES! still hot) wrap each one in plastic wrap and place in the freezer. I like to make my cakes ahead of time, so this tip works. They will keep in the freezer for quite a while. If storing for more than a few days, wrap in plastic THEN wrap in foil. The cakes will keep for weeks. If you want to use the cakes the same day, wrap in plastic wrap and cool in the refrigerator for a few hours. Make sure the cakes are completely cold before icing. Each of my little cakes are a little less than 2-inches tall. I sliced them just a bit more than 3/4-inch. 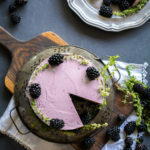 For the Strawberry Swiss Meringue Buttercream substitute 6 tablespoons of Blackberry puree in place of the strawberry puree. Buttercream can be made in advance and stored in the refrigerator for 3-4 days or frozen for several weeks. Thaw frozen buttercream overnight in the refrigerator. Bring to room temperature then beat until creamy. If the buttercream happens to have a curdled look to it, that means it is too cold. Take a warm wash cloth and place on the bottom of the mixing bowl while beating. Continue this process just until the mixture is silky smooth. Not melt the butter! This type of buttercream is the only icing one should put on a cake. It’s melt in your mouth creamy, silky smooth, rich but not sugary. It’s AMAZING!!! You can pipe the icing in between the layers or measure out equal amounts of icing for each layer. Piping is quick and easy, as you can see I’m still challenged in the piping department, but no one will ever see between the layers. Ice the top and sides. 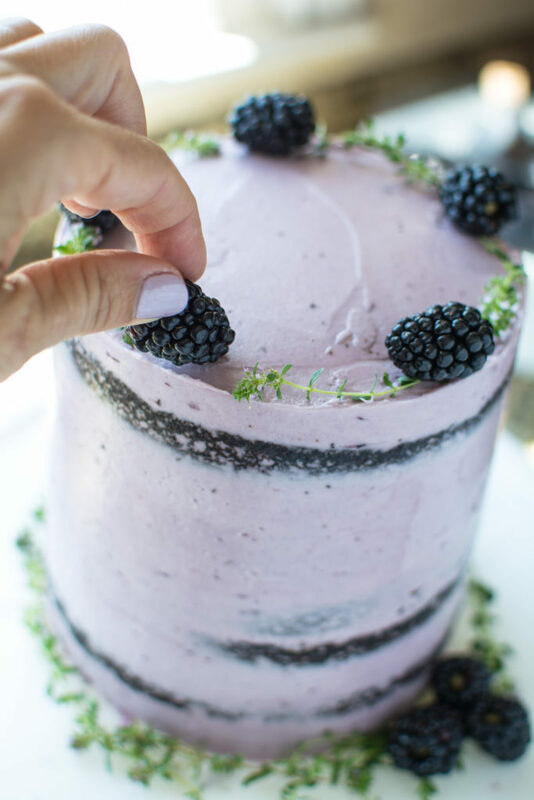 I wanted to create a more rustic, botanical look for my little cake, so I quickly spread the icing to give it a more naked look. 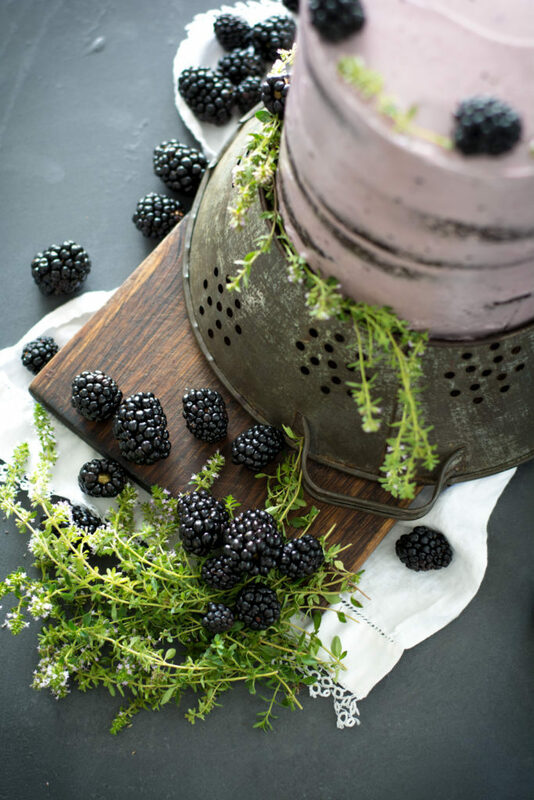 Topped with Willard Bay blackberries and sprigs of thyme from my garden. 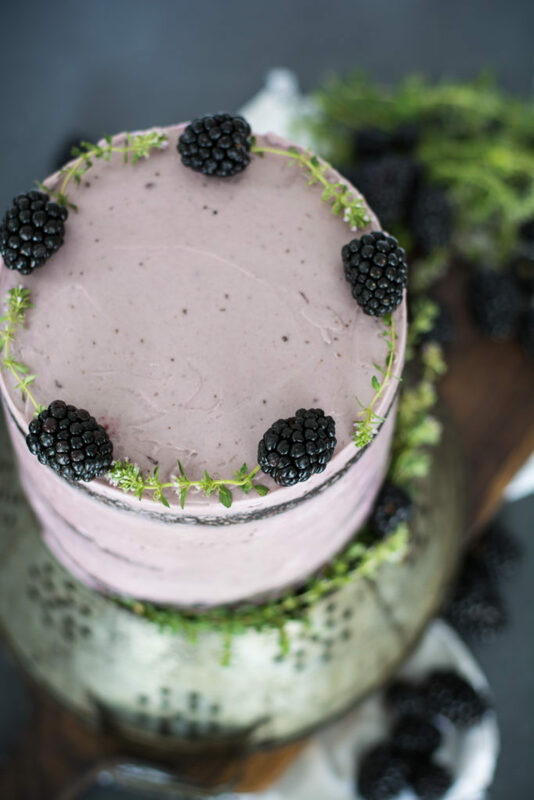 This recipe for Zucchini Chocolate cake is extremely moist and tender with an earthy blackberry buttercream. Preheat oven to 350 degrees. Grease and flour three 6-inch round cake pans. Line with a parchment paper. Set aside. In a large bowl sift together flour, cocoa, baking soda and salt. Set aside. In the bowl of a stand up mixer beat eggs, With the mixer running, slowly add sugar and mix until light yellow in color. Slowly add olive oil, buttermilk and vanilla. Mix until smooth and light in color. Beat in flour and cocoa mixture until smooth. Fold in grated zucchini then boiling water. Pour batter into prepared baking sheet and place in preheated oven. Bake for 30 minutes or until cake springs back when lightly touched. Remove from oven and cool for 5 minutes. 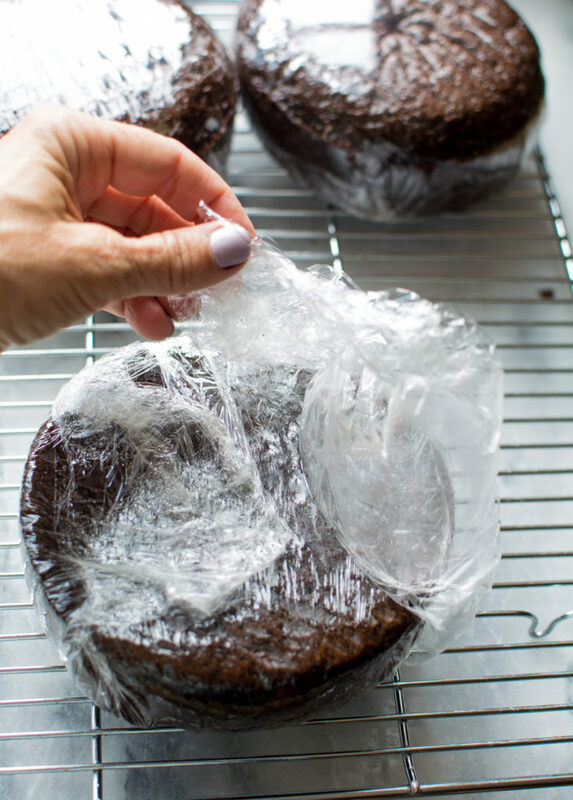 Invert cakes onto a cooling rack until completely cool OR for a moister cake immediately wrap in plastic and wrap and place right into a freezer. Can be frozen for several days, or place is a refrigerator until completely cool before using. In a very clean bowl of an electric mixer, add egg whites and sugar. 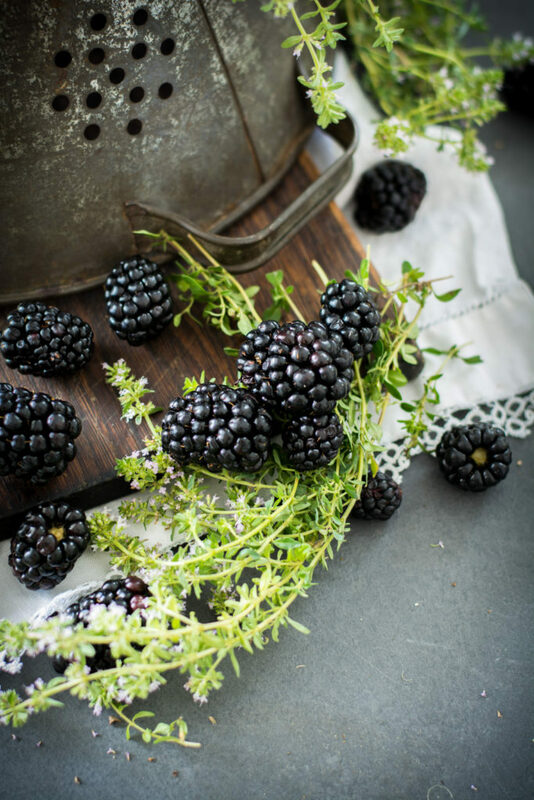 Place over a simmering pot of water, stirring constantly until temperature reaches 160 degrees F. Rub a small amount of the mixture between two fingers to make sure the sugar is dissolved. Remove from heat. Using the whisk attachment, beat until the mixture is a thick meringue and the bottom of the bowl is cool to the touch. The bowl must be cool before adding the butter. Replace the whisk with the paddle attachment. With the mixture on medium-low speed add butter once slice at a time until all of the butter has been incorporated. The mixture should be silky smooth and thick. The mixture may begin to look curdled, keep mixing until it is smooth. This can take 10 minutes or so. Mix in salt and vanilla. Add strawberry puree, if using. Once the puree is added keep mixing until mixture is silky again. Replace the whisk with the paddle attachment. With the mixture on medium-low speed add butter one slice at a time until all of the butter has been incorporated. The mixture should be silky smooth and thick. The mixture may begin to look curdled, keep mixing until it is smooth. This can take 10 minutes or so. Mix in salt and vanilla. Add strawberry puree, if using. Once the puree is added keep mixing until mixture is silky again. This type of buttercream is the only icing one should put on a cake. It's melt in your mouth creamy, silky smooth, rich but not sugary. It's AMAZING!! !